The company offers more than 240 tests, ranging from cholesterol to cancer. It claims its technology can work with just a finger prick. Investors have poured more than $400 million into Theranos, valuing it at $9 billion and her majority stake at more than half that. The 31-year-old Ms. Holmes’s bold talk and black turtlenecks draw comparisons to Apple Inc. cofounder Steve Jobs. But Theranos has struggled behind the scenes to turn the excitement over its technology into reality. 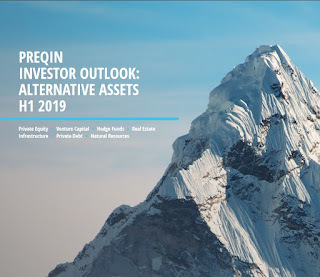 At the end of 2014, the lab instrument developed as the linchpin of its strategy handled just a small fraction of the tests then sold to consumers, according to four former employees. One former senior employee says Theranos was routinely using the device, named Edison after the prolific inventor, for only 15 tests in December 2014. Some employees were leery about the machine’s accuracy, according to the former employees and emails reviewed by The Wall Street Journal. In a complaint to regulators, one Theranos employee accused the company of failing to report test results that raised questions about the precision of the Edison system. Such a failure could be a violation of federal rules for laboratories, the former employee said. Theranos also hasn’t disclosed publicly that it does the vast majority of its tests with traditional machines bought from companies like Siemens AG . But Theranos’s outside lawyer, David Boies, acknowledges that the company isn’t yet using the device for all the tests Theranos offers. The transition to doing every test with the device is “a journey,” he says. Asked about the claim on the company’s website, Mr. Boies replied that using the device for the “full range” of blood tests is a goal Theranos will eventually achieve. Theranos points out that it has publicly disclosed doing “certain esoteric and less commonly ordered tests” with traditional machines on blood drawn with smaller needles from veins. Ms. King and Mr. Boies say Theranos’s lab work is accurate. Theranos has performed tests on millions of patients referred by thousands of doctors and has received highly positive feedback, they say. Ms. Holmes, Theranos’s chairman and chief executive, declined interview requests from the Journal for more than five months. Last week, the company said she would be available to comment, but her schedule didn’t allow it before publication of this article. Other doctors said they stopped steering patients to Theranos because of results they didn’t trust. “I don’t want my patients going there until more information and a better protocol are in place,” says Gary Betz, an internist in Phoenix. Ms. Holmes launched Theranos in 2003 when she was 19 and dropped out of Stanford University in her sophomore year. 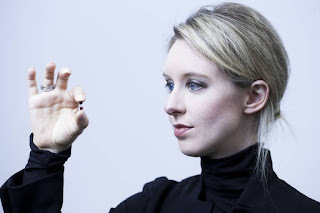 Theranos is built around Ms. Holmes’s self-professed phobia of needles. She has said in numerous public appearances that drawing a tiny amount of blood at a time from each patient’s finger and avoiding the large syringes used by traditional labs will make patients less reluctant to get blood tests. That will lead to earlier diagnoses and save lives, according to Ms. Holmes. Her first idea was a small arm patch to screen blood for infectious diseases and deliver antibiotics, according to Phyllis Gardner, a Stanford medical-school professor with whom Ms. Holmes consulted at the time. The patch never made it to market. “She was a young kid with only rudimentary engineering training and no medical training,” says Dr. Gardner, whose husband was a member of a Theranos advisory board and still owns shares in the company. In 2005, Ms. Holmes hired Ian Gibbons, a British biochemist who had researched systems to handle and process tiny quantities of fluids. His collaboration with other Theranos scientists produced 23 patents, according to records filed with the U.S. Patent and Trademark Office. Ms. Holmes is listed as a co-inventor on 19 of the patents. The patents show how Ms. Holmes’s original idea morphed into the company’s business model. But progress was slow. Dr. Gibbons “told me nothing was working,” says his widow, Rochelle. In May 2013, Dr. Gibbons committed suicide. Theranos’s Ms. King says the scientist “was frequently absent from work in the last years of his life, due to health and other problems.” Theranos disputes the claim that its technology was failing. After Dr. Gibbons’s widow spoke to a Journal reporter, a lawyer representing Theranos sent her a letter threatening to sue her if she continued to make “false statements” about Ms. Holmes and disclose confidential information. Ms. Gibbons owns Theranos shares that she inherited from her husband. Theranos began offering tests to the public in late 2013. It opened 42 blood-drawing “wellness centers” in the Phoenix area, two in California and one in Pennsylvania. Most are in Walgreens Boots Alliance Inc. drugstores. Ms. Holmes successfully lobbied for an Arizona law that allows people to get tests without a doctor’s order. Theranos’s promise of fast results and prices that are “a fraction” of other labs pits it against Quest Diagnostics Inc. and Laboratory Corp. of America Holdings, which dominate the $75 billion-a-year blood-testing industry in the U.S. While the biggest venture-capital firms specializing in health care aren’t listed as Theranos investors, Oracle Corp. cofounder Larry Ellison and venture-capital firm Draper Fisher Jurvetson, have bought stakes in Theranos, according to data from Dow Jones VentureSource. 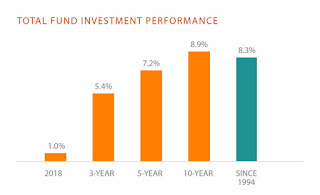 Theranos has raised several rounds of financing, most recently in June 2014. Like most closely held companies, Theranos has divulged little about its operations or financial results. Clinical labs usually buy their testing instruments from diagnostic equipment makers. Before those makers can sell to labs, they must undergo vetting by the Food and Drug Administration. Because Theranos doesn’t sell its Edison machines to other labs, it didn’t need the FDA’s approval to start selling its tests. Still, the company has sought clearance for more than 120 of its tests in an effort to be rigorous and transparent. In July, Theranos announced the first FDA clearance of one of those tests, which detects herpes. The FDA and Theranos decline to comment on the status of the other submissions. Whether labs buy their testing instruments or develop them internally, all are required to prove to the federal Centers for Medicare and Medicaid Services that they can produce accurate results. The process is known as proficiency testing and is administered by accredited organizations that send samples to labs several times a year. Labs must test those samples and report back the results, which aren’t disclosed to the public. If a lab’s results are close to the average of those in a peer group, the lab receives a passing grade. Senior lab employees showed both sets of results to Sunny Balwani, Theranos’s president and chief operating officer. In an email, one employee said he had read “through the regulations more finely” and asked which results should be reported back to the test administrators and government. Former employees say Mr. Balwani ordered lab personnel to stop using Edison machines on any of the proficiency-testing samples and report only the results from instruments bought from other companies. In its everyday business at the time, Theranos routinely used Edison machines to test patients’ blood samples for vitamin D, the two thyroid hormones and prostate cancer, the former employees say. 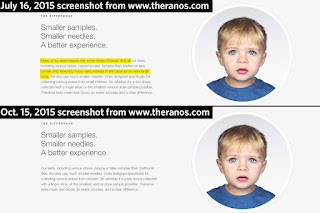 In March 2014, a Theranos employee using the alias Colin Ramirez alleged to New York state’s public-health lab that the company might have manipulated the proficiency-testing process. Stephanie Shulman, director of the public-health lab’s clinical-lab evaluation program, responded that the practices described by the anonymous employee would be a “violation of the state and federal requirements,” according to a copy of her email. What the employee described sounded like “a form of PT cheating,” Ms. Shulman added, using an abbreviation for proficiency testing. She referred the Theranos employee to the public-health lab’s investigations unit. The New York State Department of Health confirms that it got a formal complaint in April 2014 “in regard to testing practices at Theranos” and forwarded it to the Centers for Medicare and Medicaid Services. Asked about the complaint, Theranos confirms that the Edison system produced results for several tests last year that differed from results obtained from traditional equipment. 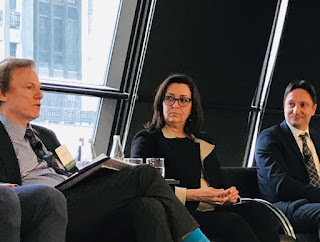 But that comparison was based on “left-over proficiency testing samples” used “to conduct additional experiments and verify best practices,” says Ms. King, Theranos’s general counsel. The company has never failed proficiency testing, she adds. She says Mr. Balwani’s instructions were consistent with the company’s “alternative assessment procedures,” which it adopted because it believes its unique technology has no peer group and can be thrown off by the preservatives used in proficiency-testing samples. Theranos has been “upfront and transparent with regulators” about the procedures, Ms. King adds. As of the end of 2014, Theranos did less than 10% of its tests on Edison machines, including tests for prostate cancer and pregnancy, one former senior employee says. In addition to the 15 tests run on the Edison system, Theranos did about 60 more on traditional machines using a special dilution method, the former senior employee says. The company often collected such a small amount of blood that it had to increase those samples’ volume to specifications required by those traditional machines, former employees say. A third set of about 130 tests was run on traditional machines using larger samples drawn from patients’ arms with a needle. For tests done with dilution, the process caused the concentration of substances in the blood being measured to fall below the machines’ approved range, three former employees say. Lab experts say the practice could increase the chance of erroneous results. Most labs dilute samples only in narrow circumstances, such as when trying to find out by how much a patient has overdosed on a drug, say lab experts. Theranos says dilution is common in labs but declines to say if it dilutes samples. Theranos’s “methods for preparing samples for analysis are trade secrets and cannot be revealed,” Ms. King says. Those methods “have been disclosed” to regulators and don’t “adversely impact the quality of its tests or the accuracy of its test results,” she adds. Former employees say diluting blood drawn from fingers contributed to accuracy problems early last year with a test to measure potassium. Lab experts say finger-pricked blood samples can be less pure than those drawn from a vein because finger-pricked blood often mixes with fluids from tissue and cells that can interfere with tests. Some of the potassium results at Theranos were so high that patients would have to be dead for the results to be correct, according to one former employee. Theranos challenged interpretations of its test results by health-care providers and patients whose medical records were reviewed by the Journal. After those people spoke to the Journal, Theranos visited some of them and asked them to sign prepared statements that said the Journal mischaracterized their comments. Two did and one refused. 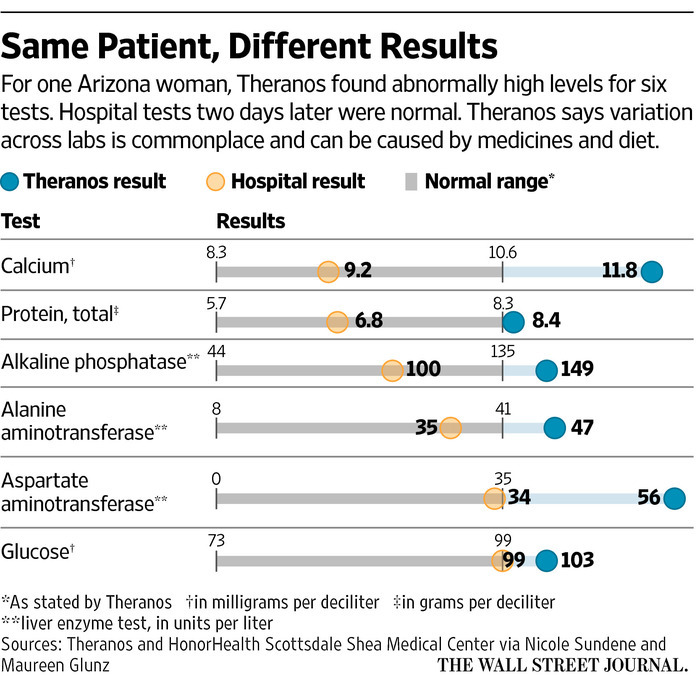 Carmen Washington, a nurse who worked at a clinic owned by Walgreens in Phoenix, says she began to question Theranos’s accuracy after seeing abnormal results in potassium and thyroid tests. She says she raised her concerns with the drugstore operator and Theranos’s lab director, asking for data to show that the company’s finger-prick testing procedures produced results as accurate as blood drawn from a vein. “They were never able to produce them,” she says. Ms. King says the company did show detailed testing-accuracy data to the nurse. A Walgreens spokesman says the nurse kept writing lab orders for Theranos tests until she stopped working at the clinic in February. Walgreens says its partnership with Theranos has gone smoothly overall. About a dozen doctors and nurses complained about test results by phone or email to the company from late 2013 to late 2014, a person familiar with the matter says. The Arizona attorney general’s office, state health department and Better Business Bureau say they have received no complaints about Theranos. Dr. Betz, the Phoenix doctor, says one of his female patients went to Theranos in August 2014 for a routine potassium test to monitor potential side effects from her blood-pressure medication. He says Theranos reported that her potassium level was close to the threshold considered critical. Another lab reran the test three days later. The results came back normal. Ms. King says Dr. Betz’s nurses kept sending patients to Theranos until early this year. Real-estate agent Maureen Glunz went to Theranos a few days before last Thanksgiving after complaining of ringing in her ear. Her blood was drawn from a vein in her arm. The results showed abnormally elevated levels of glucose, calcium, total protein and three liver enzymes. Her primary-care doctor, Nicole Sundene, who is a naturopath, worried that Ms. Glunz might be at risk of a stroke and asked her to go to an emergency room. The hospital’s tests two days later showed nothing abnormal. Ms. King says “some degree of variability in lab results across different laboratories is commonplace,” adding that Ms. Glunz’s medication and diet could have caused “fluctuations” in her results. None of the results were “close to the critical range,” Ms. King adds. It is misleading to draw conclusions from “a handful of patient anecdotes,” she says. 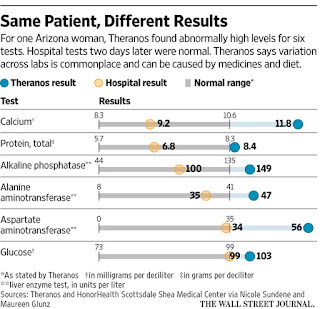 Ms. Glunz says she likes Theranos’s low prices and would go there again if she could be sure its tests are accurate. “But trial and error on people, that’s not OK,” she says. Under pressure from regulators, laboratory firm Theranos Inc. has stopped collecting tiny vials of blood drawn from finger pricks for all but one of its tests, according to a person familiar with the matter, backing away from a method the company has touted as it rose to become one of Silicon Valley’s hottest startups. The move is a setback to the Palo Alto, Calif., company’s ambition to revolutionize the blood-testing industry. As a result of the halt, Theranos is operating more like a traditional lab that draws blood with needles from patients’ arms. Theranos is valued at $9 billion, or about as much as each of the industry’s two largest companies in the U.S.
Food and Drug Administration inspectors recently showed up unannounced at Theranos, the person familiar with the matter said. The inspection was triggered by concerns the agency had about data Theranos had voluntarily submitted to the FDA in an effort to win approval for its proprietary testing methods, this person said. During the inspection, FDA officials indicated to Theranos that the agency considers the “nanotainers” made and used by the company to collect finger-pricked blood an unapproved medical device, the person familiar with the matter said. So far, the agency has approved just one of the more than 100 proprietary tests submitted by Theranos. That test detects herpes and was cleared by the FDA in July. Theranos still is allowed to use a finger prick and the nanotainers for that one test, the person familiar with the matter said. Since the inspection by FDA officials, Theranos has also been audited by the Centers for Medicare and Medicaid Services, the main regulatory overseer of clinical labs, according to people familiar with the matter. A CMS spokeswoman declined to comment. To resume broader use of the tiny vials, Theranos must have them vetted and officially approved by the FDA, the person familiar with the situation said. A page-one article in The Wall Street Journal on Thursday detailed how the company has struggled to turn the excitement over its technology into reality. At the end of 2014, the proprietary lab instrument Theranos developed as the linchpin of its strategy handled just a small fraction of the tests then sold to consumers, according to four former employees. Theranos has since nearly stopped using the lab instrument, named Edison after the prolific inventor, according to the person familiar with the situation. By the time of the FDA inspection, the company was doing blood tests almost exclusively on traditional lab instruments purchased from diagnostic-equipment makers such as Siemens AG , the person says. In the “Mad Money” interview, Ms. Holmes didn’t quantify the number of tests run on its proprietary lab instrument when asked. She is the company’s chairman and chief executive, and her ownership stake in Theranos is valued at more than $4.5 billion. Investors have pumped more than $400 million into Theranos. Ms. Holmes has been widely hailed for her vision to create new technology that offers consumers more than 240 blood tests, ranging from cholesterol to cancer. Ms. Holmes, 31 years old, has publicly said she built Theranos around her self-professed phobia of needles. Most of Theranos’s blood-drawing sites, which it calls “wellness centers,” are located inside Walgreens Boots Alliance Inc. drugstores. Forty of the blood-drawing sites are at Walgreens stores in the Phoenix area, and two more are in Walgreens stores in northern California. James Cohn, a spokesman for Walgreens, referred questions from the Journal about the FDA inspection and any changes in Theranos’s blood-drawing methods to Theranos. A blood-drawing technician at a Walgreens in the Phoenix area, reached by phone late Thursday, said Theranos had “temporarily suspended” finger-prick draws and was only drawing blood from patients’ arms with needles at that store. During the FDA’s inspection, federal officials told Theranos that it will have to resubmit data for many of the proprietary blood tests it has previously sought clearance for from the FDA, according to the person familiar with the matter. The FDA concluded that data Theranos submitted before the inspection and additional data gathered during the examination were insufficient to prove the accuracy of many of its tests, this person said. Theranos has previously said it has submitted data for tests using its proprietary technology to the FDA in an effort to be rigorous and transparent. In a news release, Theranos called the Journal article Thursday “factually and scientifically erroneous and grounded in baseless assertions.” Theranos said the Journal had “declined an opportunity” to get a demonstration of the company’s proprietary technology. A Journal spokeswoman said The Wall Street Journal “fully stands by Thursday’s article about Theranos, which was richly sourced and thoroughly researched.” She added that the newspaper had sought permission to visit Theranos’s offices to view the technology since late April. If you have never heard of Theranos and its founder and CEO, Elizabeth Holmes who also happens to be the world's youngest self-made billionaire, and you read this hatchet job by the Wall Street Journal, you'd think she is a charlatan who is peddling snake oil and her startup company is selling nothing more than a pipe dream, effectively defrauding patients looking for accurate and easy blood tests. In fact, after reading these articles, any sensible person would be wondering why doesn't the FDA shut down Theranos pending a full-blown investigation and thorough audit of thousands of blood samples tested by this company? But I would caution you to be very careful here before you jump to any conclusions. No doubt, the articles above raise very serious allegations from "former senior employees," but there is a lot of stuff in there which is highly disputable and totally outrageous bordering on slanderous. Like what? The articles question Theranos's revolutionary technology without understanding how it works. Also, the first article mentions Dr. Ian Gibbons, a British biochemist who had researched systems to handle and process tiny quantities of fluids and collaborated with other Theranos scientists to produce 23 patents. He committed suicide. While this is tragic, my father and brother who are both excellent psychiatrists will tell you it's extremely difficult to treat some forms of depression and unfortunately no matter what you do, some patients will attempt suicide (every psychiatrist's worst nightmare). Even though the article doesn't link Dr. Gibbons' suicide to anything shady going on at Theranos, it states that his widow spoke to a Journal reporter and a lawyer representing Theranos sent her a letter threatening to sue her if she continued to make “false statements” about Ms. Holmes and disclose confidential information (Theranos is right to protect its interests from a grieving widow). Second, the article above cites a primary-care doctor, Nicole Sundene, who is a naturopath, worried about her patient following blood results from Theranos. Excuse me? Since when are naturopaths considered trained medical doctors? This is the type of nonsense I can't stand reading from supposedly respected journals. Sure, there are a bunch of allegations from former employees which we don't know if they are baseless or based on hard facts. There should be strict whistleblower laws governing employees at financial services companies, healthcare companies and many other private and public organizations. If something shady is going on anywhere, I'm the first to say have the proper channels so employees can blow the whistle and report it to the proper regulatory bodies so they can immediately investigate. From that perspective, if these Wall Street Journal articles are based on hard facts, then I welcome the FDA and other regulatory bodies' actions to scrutinize Theranos's activities and make sure everything is kosher with all their blood tests. "Today’s Wall Street Journal story about Theranos is factually and scientifically erroneous and grounded in baseless assertions by inexperienced and disgruntled former employees and industry incumbents. Theranos presented the facts to this reporter to prove the accuracy and reliability of its tests and to directly refute these false allegations, including through over 1,000 pages of statements and documents," according to the statement. "Disappointingly, the Journal chose to publish this article without even mentioning the facts Theranos shared that disproved the many falsehoods in the article." 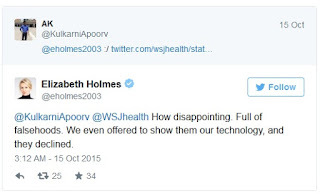 Elizabeth Holmes, the founder of Theranos, has also been tweeting about the Journal's story. She responded to one software developer's tweet, saying that Theranos offered to show the Journal its technology and they "declined." Theranos, according to the Journal, went to great lengths to make sure the Journal's report wouldn't be published. The Journal, which spoke to former Theranos employees, their families, a number of experts, and the company's lawyers for its story, said Theranos fought the paper throughout the entire investigation. Theranos even visited some of the people who spoke to the Journal for the Theranos story, and requested they "sign prepared statements that said the Journal mischaracterized their comments." The Journal provided Business Insider with this response to Theranos' statement: "The Wall Street Journal fully stands by John Carreyrou’s article about Theranos, which was richly sourced and thoroughly researched." Theranos has previously drawn skepticism from the scientific community in part because Theranos is cagey about how its tests actually work. Why do I trust Elizabeth Holmes and not the WSJ? Because she's exceptionally brilliant and has always publicly stated she favors more rigorous testing from the FDA on all companies doing diagnostic medical testing. There's another reason why I believe her, and it's a little more personal. I believe in her vision in making accurate and simple blood tests easily available to anyone who wants to know about their health status. I find it indefensible and even unconstitutional that Americans are not allowed to go by themselves to prick their finger and see if they suffer from any underlying illness (provided these tests are accurate and audited by regulatory bodies). 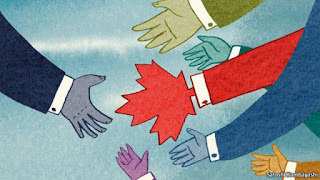 Many of you know I was diagnosed with multiple sclerosis (MS) back in June 1997 right in the middle of writing my Masters thesis in Economics at McGill University. It was a brutal blow to my self-esteem and I was going through personal hell at that time worried about my future. Luckily, even though my disease has progressed, I am still able to carry on and live a relatively normal life. I'm never going to run a marathon but that's not my goal in life and through diet, exercise (see Matt Embry's great site, MSHope.com) and drug therapy, I'm confident I will live a long and healthy life (the hardest thing about living with MS for me is dealing with people's prejudices or worse still, their pity!!). I am also surrounded by doctors (friends and family) who keep telling me: "the best way to treat any illness is to detect it early and treat it as soon as possible." This is why I believe Theranos is part of medical revolution going on right now and why I'm such a huge believer in the biotech sector too (all those pre-medicine courses during my McGill undergrad days helped me see the future). I will end by giving Ms. Holmes some advice. One of my close friends is now part of Stanford's medical faculty. He is a brilliant doctor and scientist and he is a very hard worker who questions everything in medicine and healthcare (one thing I know, he hates Dr. Oz and calls him a "quack who peddles dubious and sometimes even dangerous advice"). If he's up for it (he has no idea I'm plugging him), I would recommend she reaches out to him to put him on Theranos's scientific advisory board as he will provide the company with brutally honest recommendations on how to proceed to improve blood sample testing and make sure these allegations never resurface ever again (email me at LKolivakis@gmail.com for more information). On that note, I wish you a great weekend. Please remember to subscribe to my blog at the top right-hand side and if you have anything to add on this or other comments, feel free to reach out to me. Below, CNBC's Jim Cramer says he wants more information on Theranos after a Wall Street Journal article reveals the company uses key technology in just one test. I disagree with Cramer and think the Journal's reporting was sloppy and full of unfounded allegations which the FDA will now investigate. Also, Elizabeth Holmes, Theranos founder & CEO, responds to the Wall Street Journal article on Mad Money. In the last clip below (from the end of September), she discusses how the company has been able to make early detection a reality in a field of tough competitors. Listen to this lady, she's brilliant and she has a revolutionary vision which I hope comes to fruition one day soon. 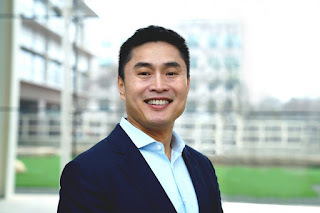 Update: Read my follow-up comment on the subprime unicorn boom in tech where I go into more details on the Theranos affair and why so many top VCs and scientists are highly skeptical of the company's claims. You should also read an article in WIRED, OK, Theranos: Here's the Data the World Needs to See. It is truly superb and asks all the right questions.